The stunning scenery of the Wye Valley makes it one of the best places in the UK for a camping or glamping holiday. This region on the border between England and Wales centres around a 50-mile stretch of the meandering River Wye and the surrounding landscape includes farmland, ancient woodland and a dramatic limestone gorge. Unsurprisingly it’s all about the great outdoors in this designated Area of Outstanding Natural Beauty; canoeing and kayaking on the river are almost-obligatory pastimes and there are enough walking trails to keep you hiking for months. Rural and riverside camping is at its best here and you can find plenty of places to pitch a tent and park up in a campervan, whether you want a slice of the action or just a place to relax. And if you’re too posh to pitch, you’re well catered-for too with glamping options galore on both sides of the border. If you’re looking for rural or riverside camping and glamping, it’s hard to beat the Wye Valley. Straddling the border between England and Wales, this river valley has been designated as an Area of Outstanding Natural Beauty; and once you see it, you’ll understand why. The river itself meanders its way through parts of Gloucestershire’s Royal Forest of Dean, Herefordshire and Monmouthshire. Its landscape varies from red sandstone and farmland in the north through ancient woodland to the steep-sided wooded ravines of the limestone gorge in the south. It includes four national nature reserves and 45 Sites of Scientific Special Interest – but tellingly just a single town; the dramatically-situated Ross-on-Wye. Camping is one of the best ways to immerse yourself in this protected rural landscape giving you the chance to stay right in the heart of it all. You can spend days walking, cycling, canoeing and kayaking to discover more of the area and some of the best campsites in the Wye Valley have been set up to cater for people who hanker for these sorts of adventure. But there are also plenty of attractions and places of interest to visit with picturesque villages within its boundaries and market towns nearby including the book-town of Hay-on-Wye and walkers’ paradise, Chepstow. 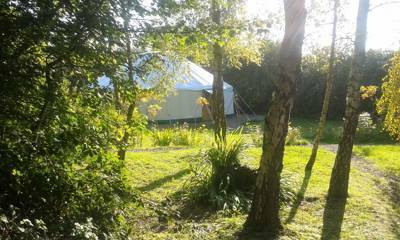 Whether you want to pitch a tent in an English meadow or go glamping in a Welsh woodland, there’ll be a Wye Valley campsite to suit you. Pitching your own tent for a bit of classic camping in the Wye Valley is a fitting way to visit the area. In a protected landscape camping just seems to fit in: it’s temporary, eco-friendly and low-impact. Here at Cool Camping, we look out for camping and glamping sites that are smaller, usually independently owned and which show respect for the environment they are in. Thankfully, the Wye Valley seems to specialise in these sorts of sites so your stay should be in harmony with the natural world. And that’s not to mention the fact that it will also be great value and great fun. Find a place to pitch your tent and you will only need to unzip your tent in the morning to start enjoying the amazing scenery. As a major destination for kayakers, canoeists and long-distance walkers, there are plenty of basic campsites that are close to the river or walking routes. 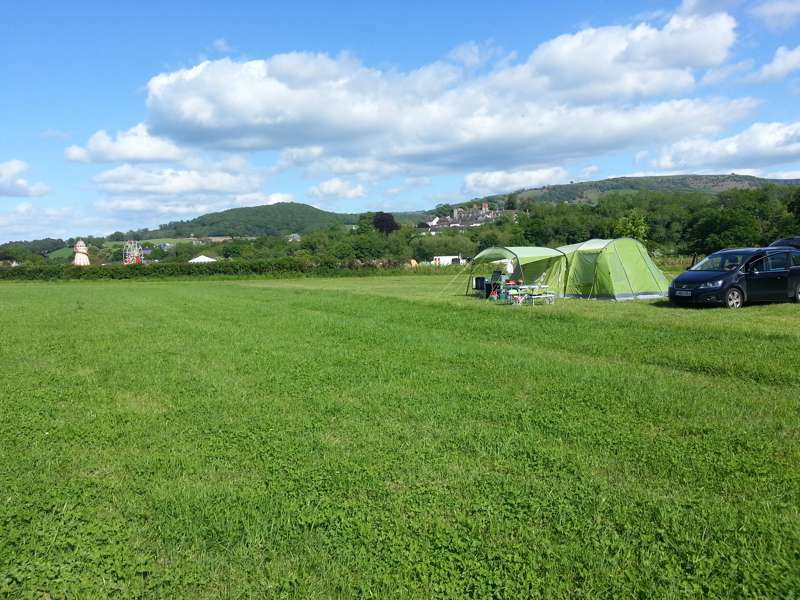 But whether you are passing through and want to pitch up for a night or are looking for somewhere for to stay for a week in the Wye Valley, there should be a campsite to suit your needs. Some of the riverside campsites will hire you kayaks and canoes and all will have information and tips on the best ways to explore the area. There are campsites which have basic facilities but an amazing location and campsites where electric hook-up is standard and facilities are top-notch. For the best creature comforts on a camping holiday, glamping is where it’s at. 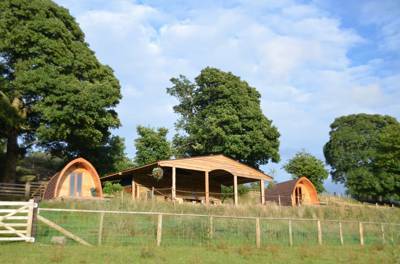 The Wye Valley, like many traditional camping areas, has embraced glamping and luxury camping and now offers a wide range of luxury tents and cabins. 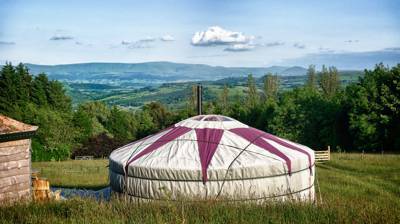 Stay in one of the bell tents, yurts, safari tents or shepherd's huts in the Wye Valley and you’ll get to enjoy the advantages of camping – including the special locations – without the hassle of putting up and (worse) taking down your tent. You’ll probably have a comfier night’s sleep too with most glamping accommodation including a real mattress or bed. And if you choose a glamping accommodation with its own toilet or bathroom, you won’t have to endure the midnight trek to the toilet with head torch clamped to the head! 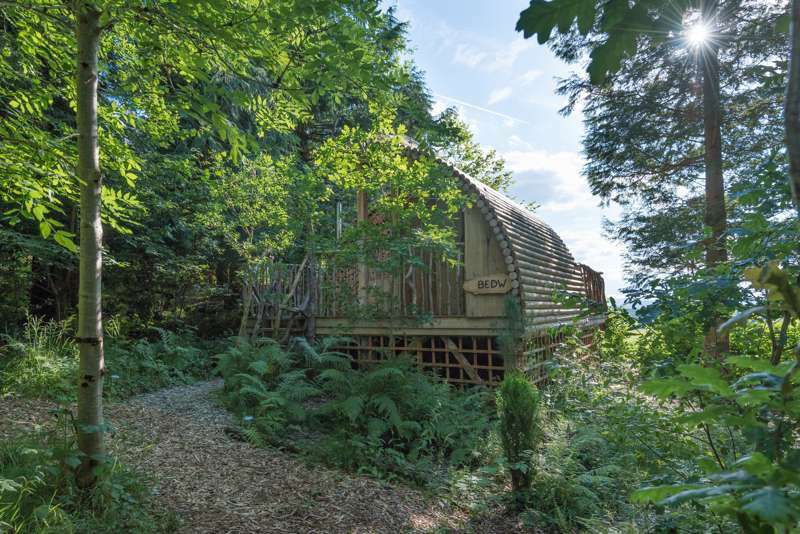 Glamping in the Wye Valley can be fun for all the family, as the happy medium between camping and staying in self-catering accommodation or a hotel, and you can make it more so by choosing a really quirky place to stay. The UK glamping scene includes some pretty eccentric options; from converted horseboxes and old-fashioned gypsy caravans to treehouses and tipis. Stay somewhere like this and the accommodation will be almost as photogenic and memorable as the Wye Valley’s stunning scenery. If you’re looking for a family-friendly holiday, camping in the Wye Valley ticks all the boxes. There are lots of family-friendly sites in the Wye Valley where there are facilities and activities that have been designed with kids in mind, but camping and glamping are almost always popular with kids anyway. Although it can be a real blessing if there’s a playground or a nature trail to follow on a campsite, sometimes just being on site is enough of an adventure itself. Younger campers tend to love the chance to spend all day, every day outside and usually embrace the sociable side of campsite life more readily than us adults; sometimes they’ll have made a friend before the first tent peg has gone in the ground! Camping in a rich natural area like the Wye Valley offers the chance for kids to get stuck in to wholesome activities like bug hunting, wildlife watching, den building and tree climbing. The Wye Valley also offers the chance for kayaking, canoeing and climbing; activities that make the area as good for families with teenagers as it is for tiny tots. In addition to all this, there are family-friendly activities and attractions from steam trains to high-ropes courses. The Forest of Dean and Wye Valley website has a section on family-friendly things to do that’ll be useful if you’re planning a family friendly camping trip in the area. The River Wye stretches 134 miles from Plynlimon, in the Cambrian Mountains of Mid-Wales to the Severn Estuary just below Chepstow. It’s the 50-mile stretch to Chepstow from Mordiford, near Hereford, that flows through the Wye Valley Area of Outstanding Natural Beauty. Almost 130 square-miles surrounding and including this stretch of river have been recognised as an AONB for more than 40 years and while it’s one of 46 in Britain, it’s the only one to straddle the border between Wales and England. The designation gives this special landscape a protected status and recognises the geology, geography, flora, fauna and historic sites as giving the area its unique charm. The Wye Valley’s only town, Ross-on-Wye, is about a third of the way from the top of the AONB. North of here, the land is red sandstone and mostly agricultural, known as the Herefordshire Lowlands. The southern part of the AONB, from Goodrich Castle to Chepstow, is the more dramatic Lower Wye Gorge. The river has carved a limestone gorge and its waters flow around soaring cliffs and wooded ravines. In this area, you’ll find the adventure capital of the Wye Valley, Symonds Yat, where you can hire kayaks and canoes, join organised adventure tours or head off to climb Symonds Yat rock. Camping near Symonds Yat is a good idea if you’re in the area for adrenaline-fuelled action. 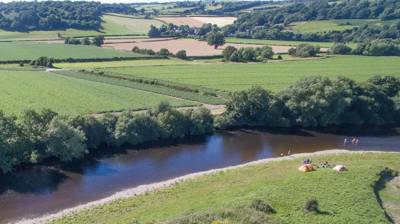 Kayaking and canoeing undoubtedly offer a fantastic way to see the Wye Valley and, sometimes, a rush of adrenaline too, but these borderlands are also incredible walking country. You can stroll on the river’s edge of course, along the Wye Valley Walk, and if you want more than a stroll, dedicate two weeks to the whole route, camping along the way. This long-distance path follows the entire course of the river from source to mouth covering 136 miles in total, criss-crossing the border as it goes. Offa’s Dyke path offers another route through the Wye Valley. A 177-mile long-distance national trail, this path follows the border along the route of Anglo-Saxon earthworks (Offa’s Dyke). It’s another two-week challenge if you want to conquer the whole route, but if you’re camping in the area you can just pull on your walking boots and choose the section that interests you most for a day on the trail. The Wye Valley Walk and Offa’s Dyke meet in Chepstow along with a number of other long-distance paths including the Gloucestershire Way, the Monmouthshire Way and the Wysis Way. In fact, the market town of Chepstow has its own walking festival and has sealed the deal as the walking hub of the area by achieving something called Walkers are Welcome status. Further afield, there are almost unlimited walking trails in the Forest of Dean, including a sculpture trail for added interest and then there’s hill walking in The Black Mountains, on the edge of the Brecon Beacons National Park. It’s not far to go to reach the Beacons and if you like bagging peaks, why not take on Pen-y-Fan, the Beacon’s highest peak at 886 metres? The big attraction of the Wye Valley is that there are no big attractions – at least, not man-made ones and no big cities and towns. The valley itself is the big attraction and nature is the star of the show. There are, however, some places that might help you make the most of your time here: we’re talking market towns and villages that are charming places to visit, perfect for stocking up on local supplies and for rainy-day activities. Calling in to Symonds Yat on the Yat Gorge is almost a must during a stay in the Wye Valley. The village links the Wye Valley with the Royal Forest of Dean and has a reputation for all things related to the great outdoors – and a number of tourist attractions too. Ross-on-Wye, is the only market town within the AONB and not far from Symonds Yat. It’s situated high above the river with a 700-year-old church and, like many towns and villages in the area, medieval half-timbered buildings. Not far from the town is Goodrich Castle, managed by English Heritage, it’s open to the public and described as one of the best-preserved medieval castles in the country. The village of Tintern is another popular destination for visitors because of the ruined Cistercian Tintern Abbey, founded in 1131. Outside of the AONB, but still on the river’s edge, Hay-on-Wye is another market town that’s worth a visit – especially if you’re a bit of a bookworm. It’s world famous for its bookshops and for the Hay Festival of arts and literature. If you want to be in town for the festival (late May/early June) get your pitch booked up well in advance as it gets pretty busy. With so much rural beauty around it might seem a shame to head in to the city, but as cities go Hereford is pretty small and can be worth the trip if you’re interested in medieval history. Its cathedral is home to Europe’s largest medieval map, the Mappa Mundi. The city has a modern shopping centre with a good range of modern shops if you’ve forgotten something for your trip. There’s tourist information and a cider museum too. Kayak, canoe or raft through the Lower Wye gorge. Take a walk. There’s plenty of routes to choose from including the Offa’s Dyke Path and the Wye Valley Way. Go climbing! Experienced climbers can give Symonds Yat Rock a go, beginners can join a guide or head for a high ropes adventure in the Forest of Dean. Find a spot on the border where you can stand with one foot in England and one foot in Wales! Pick up some holiday reading from one of the book shops in Hay-on-Wye. Go bat watching! The Wye Valley is internationally important for its bats – especially the rare lesser horseshoe bat. Pop in to Hereford Cathedral to see Europe’s largest medieval map, the Mappa Mundi. Enjoy a BBQ or campfire meal using local produce: Hereford beef burger and Wye Valley beer anyone? Wye Valley Area of Outstanding Natural Beauty AONB Forest of Dean the wye river at Campsites in the Wye Valley, Pitch your tent in the Wye Valley with this recommended collection of campsites, chosen by the expert authors of the Cool Camping guidebooks. From riverside wonders to hidden woodland campsites, discover the best Wye Valley camping now.